Andrew has appeared on numerous television programs. His first appearance was in 1988 as expedition leader in the Kestrel Film and Video documentary "High and Wild" about Andrew leading a group of urban young adults into the Victorian High Country and teaching them survival skills and wilderness values. In 1991 Andrew appeared alongside veteran UK presenter Judith Chalmers on an episode of London Weekend Television's 'Wish You Were Here'. In 1994 Andrew presented prime time segments on Australian national television for Channel 7's 'The Great Outdoors'. In 2008 Andrew presented regularly on Channel 9's food show FreshTV. 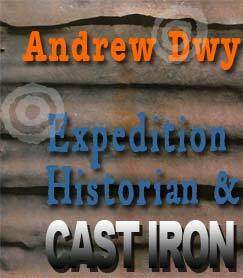 Andrew has also worked with BBC survivalist Ray Mears on Ray Mears goes Walkabout, as well as BBC Geologist Iain Stewart on Earth the Biography. Click here to go to Andrew's Youtube channel for samples of his performances.